While we’re pretty happy with the tiny house guide we’ve put together here at Insteading, we also recognize that it’s great to have a physical book of photographic inspiration to look at when planning your own tiny house. 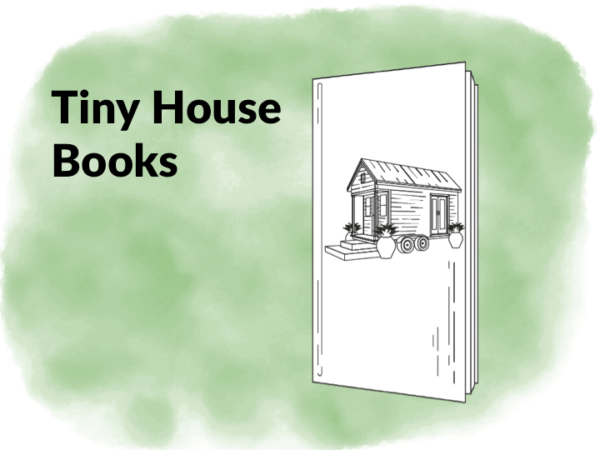 Here are some of our favorite tiny house books and links to their Amazon reviews. Tiny House Living is a great all around resource for the tiny house curious. The book contains worksheets and exercises for a variety of goals, construction and lifestyle tips for small spaces, and tours of 11 tiny homes with interviewers of their owners. The aspiring tiny home builder will find plenty of great insights in the Tiny House Design and Construction Guide. By focusing solely on the build and construction process, Dan Louche is able to go in depth on the actual challenges and decisions to be made when building a tiny home, covering everything from purchasing the trailer to connecting your electrical system. Another good all-around resource, Tiny Houses goes into tiny home lifestyle, construction considerations, and even includes some example plans and blueprints. It’s brief at 62 pages, but affordable. This book is laid out by sizes (ranging from 8′ x 12′ all the way up to 12′ x 24′). Some of these plans include more traditional small hosues, not just the tiny house on wheels format that is so popular. The book has mixed reviews on Amazon, primarily because it is dense with floor plans as opposed to written content. Weissmann is one of the early employees of the Tumbleweed Tiny House Company, and this book is filled with great photography of actual lived-in tiny homes. With 131 pages and over 100 photos of homes between 89 to 172 square feet, it’s easy to find yourself staring at the details inside these homes. This is quite a niche book, focused exclusively on the topic of where exactly you’re going to place your tiny home, and all of the considerations that come with that decision, including zoning, handling neighbors and landlords, and factors like renting or buying land. One of the only memoirs on our list, The Big Tiny goes a bit deeper into the personal and lifestyle decisions that come with making the jump to living in a tiny house. Author Dee Williams tells the story of building her 84 sq ft tiny home by herself over 10 years ago. This highly rated book features full-color photos of 59 different buildings with commentary, as well as 6 different building plan examples to get your gears turning. Diedricksen also includes some helpful information on salvaged and recycled material usage and general tips on small house living. This book documents a new trend towards smaller housing, featuring 24 homes between 500 and 1640 sq ft, and 5 smaller homes under 500 sq ft in a bonus section. While not specific to tiny houses on wheels, this book still features plenty of ideas for tiny home storage and design. Be sure to read through the reviews on Amazon for more details – this one is highly rated. I love that this book features non-traditional tiny homes, like tree houses and floating tiny homes, so the book gets outside of the typical tiny house formats and floor plans that you see in most books. The book itself is a bit tiny at 7″ x 7″, so don’t expect an enormous coffee table book- lots of reviewers cited this and small print as a problem. This book is entirely devoted to mobile tiny homes – in vans, pickup trucks, buses, sailboats, trailers, and even houseboats. The book boasts 1000 color photos so there’s no lack of eye candy, and the reviews reflect it. Definitely check this book out if you’re looking for tiny house inspiration. Another book from Lloyd Kahn filled with great photography (1,300 photos, to be specific). With 150 tiny homes and their builders, all homes under 500 sq ft, this is another in depth set of tiny house photos. Awesome resources! I will definitely be sharing them to promote the tiny house movement. Upload a photo / attachment to this comment (PNG, JPG, GIF - 6 MB Max File Size): (Allowed file types: jpg, gif, png, maximum file size: 6MB.